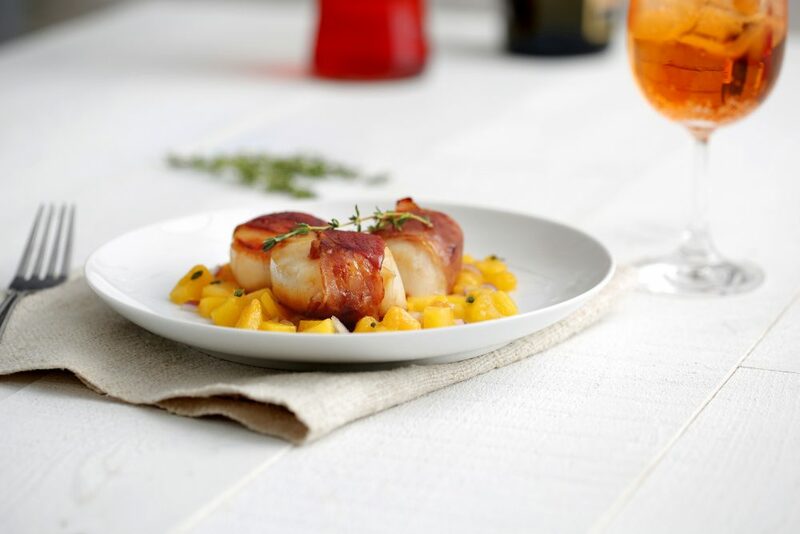 Move over bacon — prosciutto wrapped scallops are brought to a whole new level after they are wrapped with Prosciutto di Parma that has been brushed with a thin layer of fig jam. Summer peaches combined with red onion, lemon juice and fresh thyme make a tasty salsa to serve on top that complements the flavors of Prosciutto di Parma perfectly. These prosciutto wrapped scallops make a delicious summer night’s dinner. Another option is making a bunch and serving them on a platter at your next party. Combine peach, red onion, olive oil, lime juice and thyme. Refrigerate until ready to serve. Cut prosciutto in half lengthwise then fold in half lengthwise. Cut in half crosswise and spread one side of each prosciutto piece with fig jam. Wrap one piece of prosciutto, fig jam touching scallop, around each scallop. In a large non-stick skillet over medium-high heat, cook scallops until cooked through. (about 5 minutes on each side) Cook in batches, if necessary. Transfer to a serving dish and top with salsa.